Roundball Manor visits College Hoops ~ Roundball Manor - The House that Basketball Built. While I don’t necessarily expect any young, prolific, “Shaka Smart” to pep-talk an unknown mid-major through the RPI gauntlet into the Final Four and the hearts of Americans everywhere in the 2013 tournament, I’d wager that overall “toughness” will be the prevalent common factor among the four teams that roll to the finals… Quite arguably two of the toughest teams in the country, Pittsburgh (#16) and Marquette (#18), crossed in Milwaukee yesterday afternoon for a pivotal Big East contest. Conference standing and tournament seeding implications aside, any March Madness champion of the underdog or bracket-buster gambler that hasn’t scoped at least one of these teams as a “Sweet 16” prospect needs to tune in immediately. Although neither squad has breached top-10 status at any point this year, nor are they evoked in ‘championship contender’ dialogs among experts, Pitt and Marquette meet again after each has cemented a national presence through impressive win streaks that consistently boast 8-10 different players on the scoring sheet. In the end, Marquette defeated the Panthers for the second time this season, 79-69, to extend their home record to 14-0. Pittsburgh, who entered the game with the nation’s 5th-best points-against average, allowed more than 75 points for the first time in 49 games. Their reputed defense, built in part by rebounding and preventing second-chance scoring opportunities, was nullified by the Golden Eagles’ uncannily efficient shooting that racked 42 points in the first half, largely on first attempts. working his Rockettes routine for the crowd. While’s Marquette’s vigilant defense and capacity for offensive windfalls could make them a menacing 4 or 5 seed for unfamiliar teams (think Butler in 2010), Pittsburgh is an equally interesting team to watch come March. Pitt’s overall 20-6 record includes early season victories against mid-major tourney-regulars Oakland, Detroit and Lehigh (who knocked off #2 seed Duke in the first round of the 2012 tourney), as well as impressive road wins against Cincinnati and Georgetown. 5 of Pitt’s 6 losses have come to ranked teams, including near-misses away from home against former #1 squads, Michigan and Louisville; the 10-point loss to Marquette was the first time the Panthers were defeated in double digits this season. 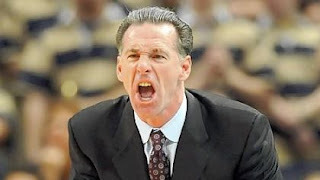 Jamie Dixon mean muggin' in the steel city! Upon their second bout with Marquette, the Panthers also sat atop the nation in assist-to-turnover ratio and rank 6th in overall assists, winning 7 of their last 8 games, including a decisive home victory over championship favorite Syracuse… Until then, Pitt had been overshadowed by a disappointing 2011-2012 effort that fell victim to an injury to starting point guard, Tray Woodall. Let’s not forget that two years ago Pitt entered the NCAA Tournament as a #1 seed, and pillars of their current 10-man rotation- Tray Woodall, Dante Taylor, JJ Moore, Talib Zanna and Lamar Patterson- all clocked regular playing time on the 2010-2011 tournament team… After the loss, ‘900 Club’ Syracuse coach, Jim Boeheim, may have quoted a harbinger of Pittsburgh’s potential when he remarked, “This is by far the best team we’ve played this year.” …Get your brackets ready!